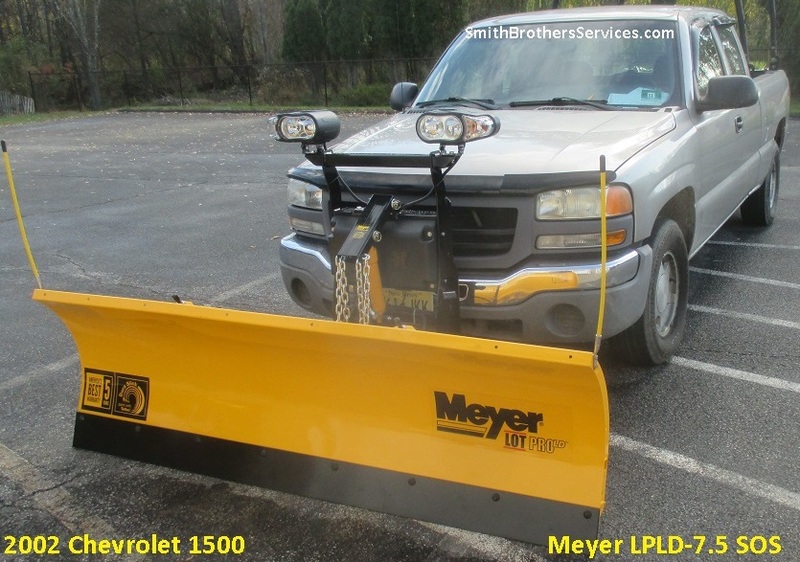 ﻿ MeyerLotPro.com - Meyer SOS (Standard Operating System) Lot Pro plows using the E-73. For almost 10 years, the Lot Pro remained almost the same, with no changes to the EZ Plus Lift Frame, and only slight changes to the A Frame. Originally it used the E-58H hydraulic system, and later, the E-72 became standard. In 2015 Meyer began rolling out the new Standard Operating System (SOS for short). It uses the E-73 hydraulics, and shares NO wiring with the previous run, not even the controller is the same, it will ONLY control the SOS E-73. It uses a different A Frame, and Lift Frame. You might want to familiarize yourself with the SOS, because for the 2018 - 2019 season, it will be all that Meyer offers for ALL of their plows, including the Super V plows (so we are told). We will not be able to order a complete old style system, the SOS is it. The only way you are going to get the old system is if a dealer has old stock, becuase they can't order it anymore. This presents a HUGE problem for fleet customers, because it will be costly to integrate the SOS into the fleet if you want to use it on more than one vehicle in the fleet. Up until the SOS, Meyer plows were VERY fleet friendly. Hook up the plow, move the controller, and off you go. That is not the case anymore. It can be confusing. The SOS is evolving rapidly, with many changes already in only a couple of years. Meyer is making it more confusing, because the EZ Plus is a MOUNTING system, and the SOS is an OPERATING system (the word Operating is right in he name). Meyer is calling the EZ Plus, the EZ Plus System, and the SOS the Standard Operating System, BUT the SOS uses the EZ Plus mounting system. They need to find a less confusing way to differentiate between the two, like maybe EZ Plus, and EZ Plus SOS, or EZ Plus E-73. Then there would be no doubt as to which operating system a given unit has. I will be honest, I have resisted the SOS as long as I could due to the many changes AND the way the wiring is connected. I also resisted it due to the lack of fleet flexibility for my existing fleet customers. The last Lot Pro I sold in 2017 I ordered in pieces to make it fleet friendly for a fleet customer, at an additional expense over the cost of the SOS. This was because I could not order a complete "EZ Plus" anymore, only the complete SOS. This is going to be a challenge in the future for fleet customers. Meyer has decided going forward there will be no more interfacing with the vehicle headlight systems. I can understand this, because they are becoming more and more sensitive, and require more to interface. We already had Ford specific Headlight Modules, and Headlight Modules for GM and Dodge. Headlight Adapters went from around $65 years ago to $300 with the new vehicle changes. That is quite a jump. Meyer is not the only plow manufacturer to stop interfacing with the vehicle headlights. What this means is that you need to manually turn the vehicle lights down to parking lights (running lights) when the plow is on, and you turn on the plow controller because the plow controller when turned on, turns on the plow low beams. IF you press the on/off button again, it switches to plow high beams, press it again, back to plow low beams. Not a big deal, we have been wiring Truck-Lites separately for almost 10 years. 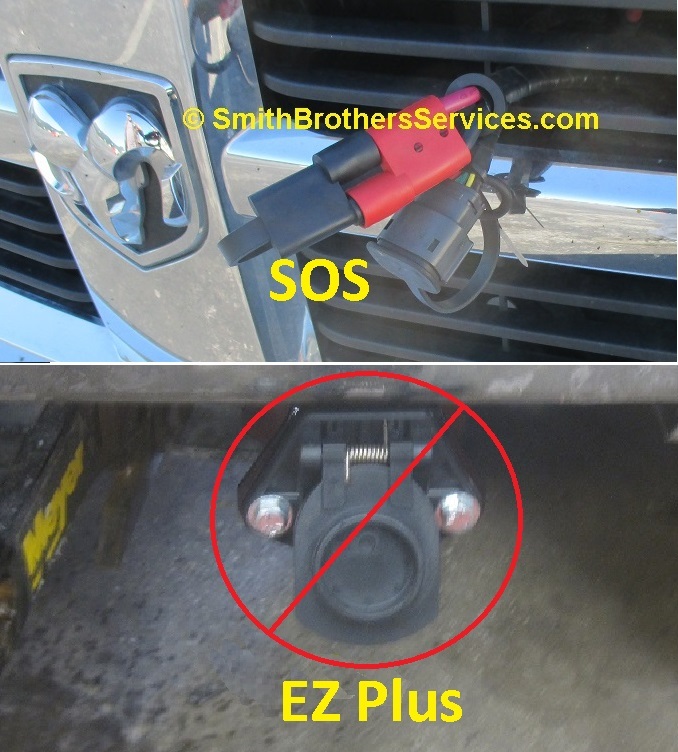 What was and is a big deal for early SOS units, is how the plow marker and turn signals are connected to the vehicle. This is unprecedented, Meyer uses the trailer plug in the rear to pick up the marker and turn signals. Initially, you actually plugged into the trailer socket. It used a 4 pin plug, connected to the 4 way trailer socket in the rear. IF the vehicle only had a 7 way, then you would need a 7 way to 4 way adapter. The SOS when it came out, was supposed to bea less expensive, simpler way to connect, with no HFP (Hands Free Plowing). Then for whatever reason, Meyer decided to run with it as the main line, and began adding features they took away. So they went from a 4 way plug, to a 7 way plug. This allowed HFP to be used. They also went to a gooseneck T harness that would be connected behind the bumper, into the back of the trailer socket. Many manufacturers already offer this connector. All it did was move the socket under the truck, it would still have the be plugged in if you wired it the way they suggested. My suggestion is cut the plug and socket off and splice the wires with heat shrink. Then it evolved more, I guess they wanted to have a proprietary connector, so they went to a 7 way T harness, BUT instead of a 7 way socket, it has a 4 way socket, BUT the ground pin (typically on a 4 way) is actaully the reverse signal to make HFP work. So it is NOT an industry standard 4 way connector in that sense. Anyway, the problem from day one connecting to the trailer plug, is every time you step on the brakes, BOTH plow turn signals light up. There is no DOT regulation against this happening, (though some local authorities may not agree and have a problem with it). I know the first time I saw it I thought the truck had a bad ground, or a short somewhere, then I remembered it was an SOS. There are "tail light converters" on the market tht will stop it from happening, BUT they will also not allow the 4 way flashers to light up the front.... So..... Meyer came out with, or is coming out with their own, that after a specfic number of attempts at lighting both, the flashers will work up front on the plow. A new little surprise on 2017 & up Ford Superduty trucks, when you connect the plow to the trailer plug, the truck thinks there is a trailer connected, shows a trailer connected on the dash, disables accident avoidance system, and rear sensors. SO, Meyer came out with a new harness that is packaged in the 17 & up Ford Mounting Carton. It is supposed to be available for us to also use on vehicles that do not have a trailer plug (such as a Jeep Wrangler Sport) BUT as of 2-12-18 we cannot order the part. Guess what? All connections are made under the hood, like they have been for the parts 50 years since plow lights were invented. Why they persist with the trailer plug after coming out iwth this new harness is beyond me. IF I can get my hands on them, I will use them on EVERY SOS install. The only thing is then the installer will have to find the reverse signal and connect to it for HFP to work (which we have been doing since HFP came out anyway). So the wiring is going back to what it was except having to tie into the headlight wiring. This would add up to about $1000 depending on the Headlight Adapter needed, and not including install labor. Now, you have to ask what is more cost effective, adding $1000 to the cost of the plow and having it fleet friendly, or installing additional wiring on all the trucks in the fleet that you might want to be able to run the SOS plow on. IF you do not have a fleet, or don't care if it only works on one truck, then no problem for you. Maybe you can sell the SOS wiring to someone that wants to add it to another truck in their fleet and recover some cost. I say that because it comes in the crate with a new SOS plow system, and unless the selling dealer wants to pull it out of the crate and save it for resale, you are getting it. Since there are currently 3 different possible truck side harnesses for the SOS to date, and two different controllers (should you want at least one spare controller), I am not going to get into total cost to add wiring for the SOS to each of the trucks, suffice to say if you have 4 trucks to add wiring to, you will be at that $1000 including install easily. The SOS controller harness plug is HUGE, and it is hard enough to find a place for a sufficient size hole through the firewall to run the harness, and the best hole already has the existing wiring (add maybe strobes, and spreader wiring as well) going through it with no spare room to fish another HUGE plug through. 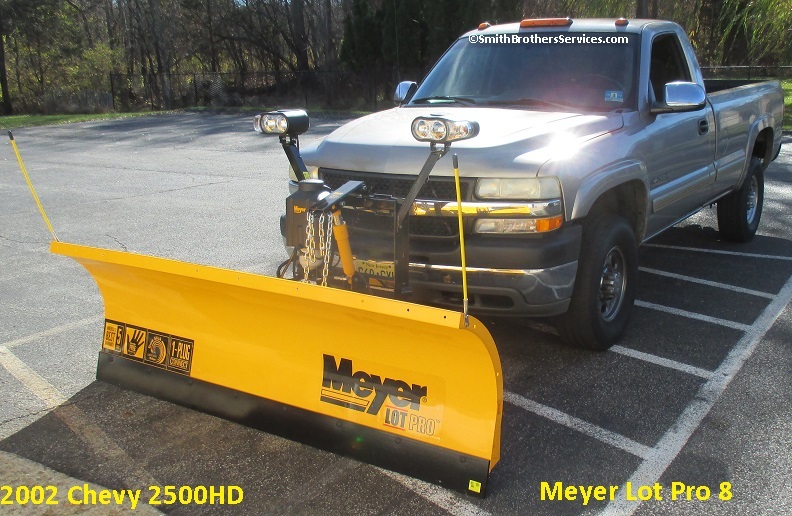 Meyer plows are my core business, they are my main business, so I am not biting the hand that feeds, I am stating fact, since none of what I said is being shared by anyone else, including Meyer. I don't even know how I am going to price the SOS installs for the fall of 2018 at this point. After 11 years of doing this on my own, it is not a good feeling. I like to think I know just about all I can about Meyer plows, and the SOS is a very grey area at this point, with very little information being released. Just a couple of pictures to compare, the same year, same color but different model trucks and plows. First is a 2500HD with Lot Pro 8. E-72 on the passenger side of the Lift Frame. Light towers adjustable height (we always use the highest setting anyway). Then we have the E-73 SOS with a Lot Pro LD-7.5. The light towers are part of the Lift Frame, and the E-73 is behind the plastic cover.